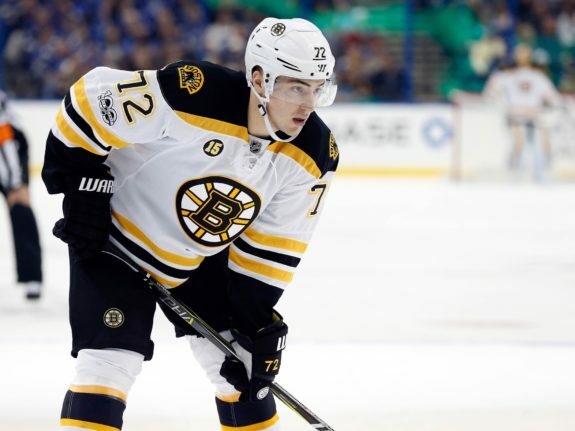 The Boston Bruins have traded forward Frank Vatrano to the Florida Panthers in exchange for a third-round selection in the 2018 NHL Entry Draft. Vatrano was placed on the injured reserve on Feb. 17. The Bruins just packaged a third-round pick and prospect Rob O’Gara to acquire Nick Holden from the New York Rangers and found a way to recoup that pick (in what will likely be a better draft position) with this deal. It’s been a rough season for Vatrano who has played in only 25 games on the year in a Bruins uniform, tallying two goals in the process. While the games-played statistic was already a rough one for the young forward, the fact that Vatrano went over one full calendar month between January and February without playing a game says a lot about the way his season has gone this year. After going undrafted, Vatrano found himself practicing with the Calgary Flames in search of an NHL job. That never materialized, but what came next for the East Longmeadow, Massachusetts native was likely more than he could have ever hoped for when he was signed by his hometown Bruins. It was an excellent start for Vatrano in Providence too following his first five-game stint in 2014-15 that saw the 5-foot-9 winger score a goal. In 36 games at the AHL level in 2015-16, Vatrano dominated the league with an astounding 36 goal and 55 points in 36 games. His work in Providence earned him 39 games in Boston that season as well – as stint that saw him post a respectable eight goals and 11 points in 39 games. Expectations grew for the winger who unfortunately never panned out to be a consistent presence in the Bruins lineup. Between a strong roster and strong prospect pool and Vatrano’s inability to stay healthy or play a consistent game, the 23-year-old simply couldn’t find his way into the lineup with any form of consistency. When he did play, his performances were often overshadowed by mistakes he would make; whether that be due to the rust from playing so infrequently or just the pressure of the deep prospect pool behind him, Vatrano couldn’t put it all together. To his credit, however, Vatrano did score 10 goals and 18 points in 44 games in 2016-17. There’s clearly a chance that he can become an NHL regular one day and now that he’s been moved to the Panthers, that potential could be realized. While the Bruins may have too much depth to consistently give ice time to Vatrano, the Panthers are a team that currently has 58 points and sits in 24th place int he NHL standings. A forward group that already features some young faces like Aleksander Barkov, Nick Bjugstad, Jonathan Huberdeau, Vincent Trocheck and more, Vatrano has the chance to reshape his career with a Panthers team looking to reshape their future. Whether Vatrano becomes a top-six forward, a bottom-six forward or a 13th forward at the NHL is anybody’s guess. 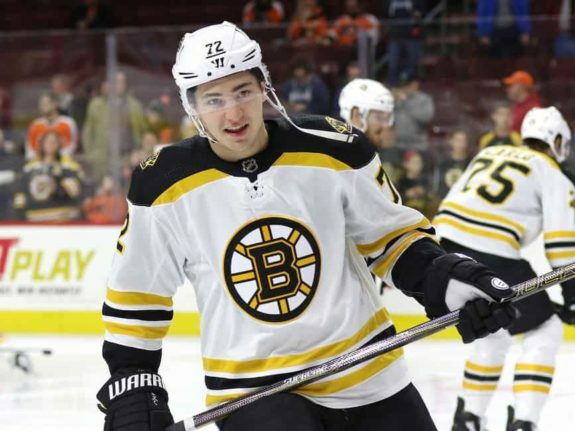 His work ethic shouldn’t be questioned, however, and that’s something to keep in mind when remembering that Vatrano is still only 23 years old. There’s a lot of time for Vatrano to continue developing at the NHL level. With his lethal shot and solid frame despite his height, the Panthers are hoping Vatrano’s production at the AHL level wasn’t simply an aberration. In 108 career games, Vatrano has scored 20 goals and 31 points. The potential is there for him to score at the next level. The Panthers are looking to give him the chance to realize that potential.